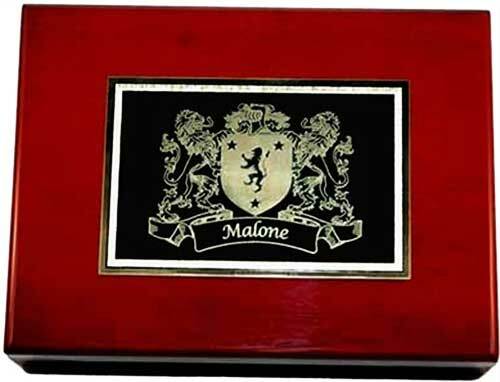 Your Irish family coat of arms is featured on the lid of this humidor with a laser engraved 4" tall x 6" wide black-coated brass plaque with a golden Florentine border. The cigar humidor features a beautiful exterior with a rosewood piano finish, along with a protective Spanish cedar wood interior. Inside the box lid are a working hygrometer and humidifier. 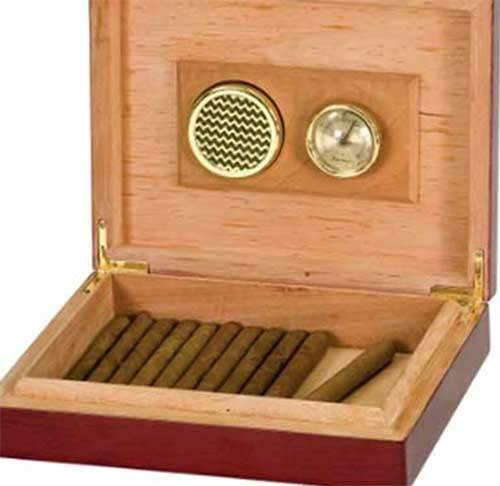 This humidor should hold 45 - 60 "average" size 6" cigars (depends upon girth of cigars). Interior dimensions are 8" x 5 5/8" and is 1 3/8" deep. Outside dimensions are 9 1/2" x 7 1/4" x 2". The Irish coat of arms humidor is the ultimate gift for your favorite cigar lover to preserve tobacco products at a constant humidity. The humidor is made in the United States; you may choose from over 900 different Irish coat of arms. The Irish coat of arms cigar humidor is a special order item that ships directly from our supplier; please allow 2 weeks for delivery. Irish coat of arms whiskey glasses are also known as low ball or rocks glasses. Irish whiskey decanter is emblazoned with your Irish coat of arms. Irish coat of arms glasses are ideal for wine. Irish coat of arms wine glasses are ideally suited for reds. Irish coat of arms wine glasses are well balanced stemless vessels that are suitable for both white and red.